"Check how your website looks with different versions of Internet Explorer"
Even though web browser updates are available for free, some people prefer not to install or update their softwares, including some of the visitors and potential customers for your website. IETester is a collection of different versions of Internet Explorer, packaged as a single application. With this nice tool you will be able to check how your website will be displayed in different versions of Internet Explorer. It is very similar to the Mozilla Firefox Collection, which allows you to test your website on different editions of one of the other famous web browsers. IETester is really easy to install as you just have to follow a few simple steps, and after a few click that process will be done. This collection will allow to find compatibility issues and other problems related to out-of-date plug-ins and extensions. 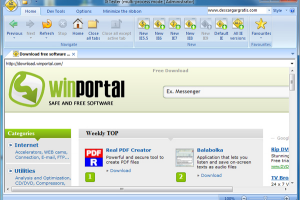 IETester includes Internet Explorer 5.5, 6, 7, 8, 9 and the Internet Explorer 10 preview edition.